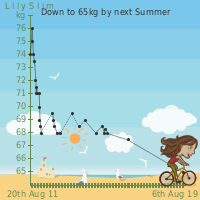 I have just added weight charts to LilySlim. A LilySlim weight chart is a free custom graphic that you can create to show changes in your weight over time. There are just 3 steps to creating a weight chart, choose your background, choose a slider, then enter chart details and your weight at different dates. More about creating a LilySlim weight chart. Customise your chart by selecting from a range of hand-drawn backgrounds and icons and entering a title for your chart. Chart up to 52 date/weight entries. Set the chart to display your weight, changes in your weight or your BMI. Change the width and height of the chart image with a range of sizes between 200 x 80 pixels to 400 x 400 pixels. How to change your chart size. Add it to many forums, emails, desktops, blogs, websites, mobile phones and on some Desktops -- wherever you can use a ticker. If you have a free LilySlim account, you will be able to come back and edit your charts, or get a new copy of your code snippet without having to create a new chart. There is more about my LilySlim accounts in the My LilySlim Help section.